An amazing array of clouds soar past Mount Shasta (enlarge this one to see the texture detail). 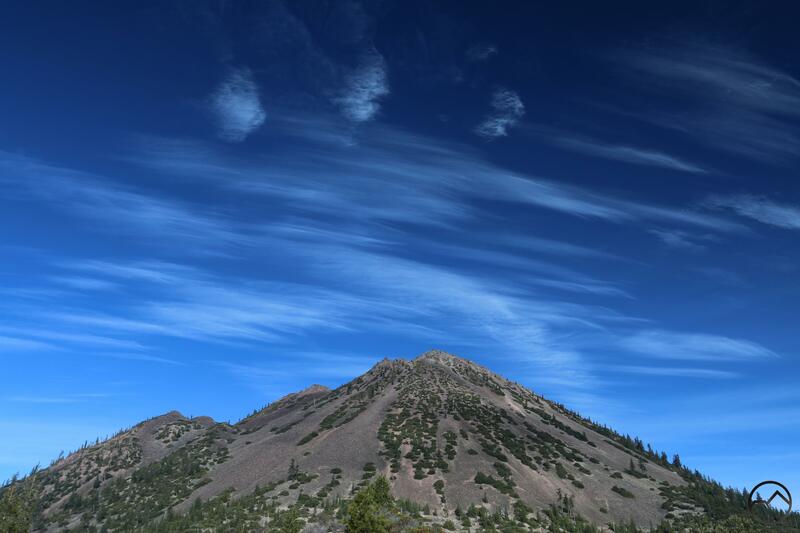 Not all of the unusual cloud formations that manifest around Mount Shasta are lenticulars. Odd or strangely formed clouds occur anywhere but somehow Mount Shasta seems to attract more than its share of those too. Yesterday (Christmas Eve eve) was a prime example of this phenomenon. The sky was filled an incredible collection clouds, some sitting right on the mountain, some hovering nearby and others flying high overhead. It was a stunning meteorological panoply. I counted at least 10 and possibly more different textured clouds in the skies around Mount Shasta. In truth, I have never seen a sky filled with so many diverse formations. It is not a sight I will soon forget. I had originally stopped to photograph the small lenticular that had formed on the summit. It was a nice cloud but not particularly noteworthy. However, it is hard for me to at least photograph it for documentary purposes. When I stopped, the clouds hung thick just above the mountain and the little lenticular began to lose its shape. I put my camera away and headed into town. On my way home I noted the clouds began breaking up and by the time I got to one of my spots, the low clouds had gone and the sky was filled with with a great many types of formations. They ranged from wispy to billowy to the small lenticular-like cloud still clinging to the summit of Mount Shasta. It was a truly stunning sight. Amazingly, the highest clouds were moving quickly and the scene was constantly changing. In the space of a few minutes clouds high above Black Butte had moved above Mount Shasta. The force of those air currents is amazing! The whole event was a terrific sight to behold. 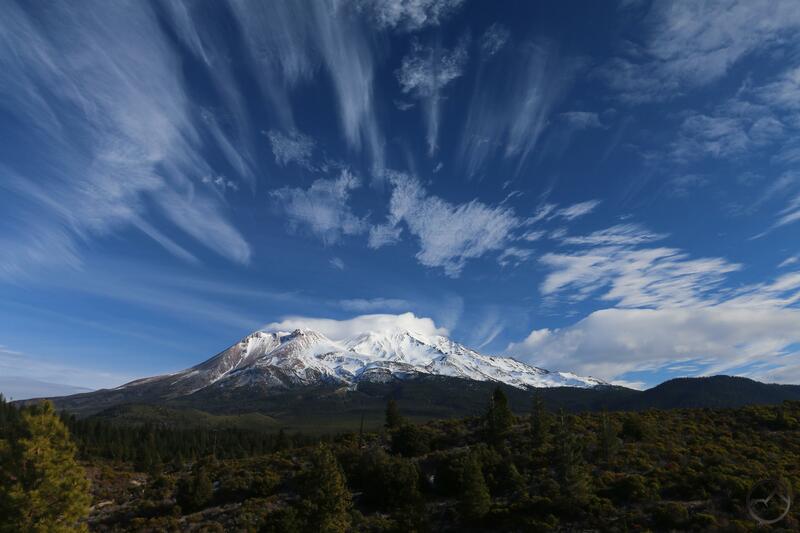 It almost seemed like a bit of a pre-Christmas present for this Mount Shasta cloud aficionado. The change was swift but watching the heavens put on a show like that is an incredible treat. These kind of weather related events make the colder, snowy months when many of the trails are inaccessible a lot easier to handle! Again, I appreciate everyone’s patience as I wax about the weather. 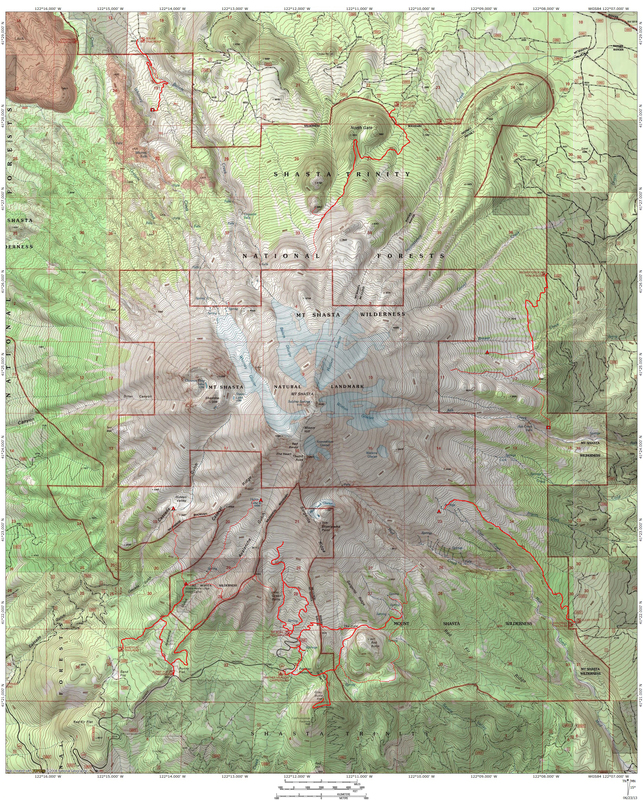 I may put up a Christmas post tommorrow and then, after some year-end stuff, I will be back to writing about hiking…unless Mount Shasta goes and puts on another epic show!